Nuwan Pradeep is a professional Sri Lankan cricketer who has emerged as a vital cog of the Sri Lankan National side in all formats of the game. The 5 ft. 10-inch right arm pace bowler is known for his swing bowling. He was born on 19th October 1986 in Negombo, Sri Lanka. Pradeep has played in the national colors for a long time now and has become an indispensable part of the team. While Pradeep might be on the wrong side of the 30’s, but still continues to be the most accurate of all bowlers of the Sri Lankan team. An enigmatic pace bowler with a slingshot action, Pradeep is back amongst Sri Lanka's plans to restore their place in the scene of world cricket. He shot into popularity after he won a pace contest in 2007, impressing the talent scouts in a softball event, and was sent straight away to Sri Lanka Cricket Academy. He follows in the Sri Lankan footsteps of maverick bowlers with unconventional actions. His slinging action has troubled many batsmen in domestic cricket. Pradeep has been a part of the Sri Lanka A which toured Australia in 2010, where he was among the quickest bowlers from both sides though he didn't have any such performances to show for his effort. Pradeep toured Sri Lanka A to Australia in 2010, where he was among the quickest bowlers from both sides. Less than a month later, he was rewarded with a call-up to the national squad for the second Test against a strong Indian side. He made his Test debut against Pakistan in October 2011, but could not take any wicket on debut. 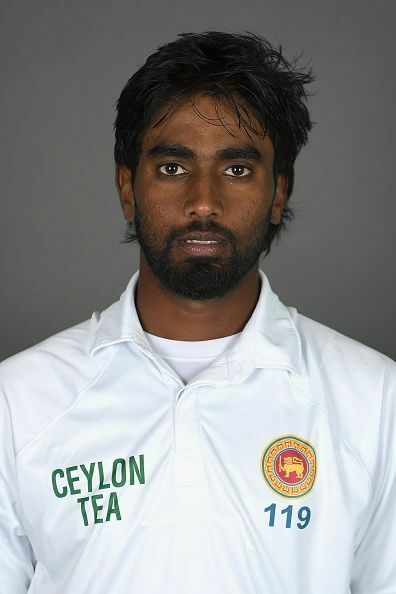 Pradeep made his ODI debut against a strong Indian side at the R. Premadasa Stadium in Colombo on 31st July 2012. On 5 July 2016, he made his T20I debut for Sri Lanka against the English Lions at the Rose Bowl Stadium. Pradeep initially made waves and shot into fame with figures of 4-29 against the English side at Derby in 2011, as he combined well with Dilhara Fernando to seal an unexpected victory in a tour game which was to be hosted by Sri Lanka. A much sharper Pradeep came into the limelight, nibbling the ball around both ways at a decisive pace. Under the tutelage and guidance of his bowling coach, Chaminda Vaas, he turned over a new leaf in his cricketing career. With an improved consistency and fitness, he now shares the new ball duties, especially on overseas tours. Pradeep has played for the Burgher Recreation club, a first-class club situated in the Sri Lankan capital of Colombo during the 2007-08 season. Pradeep has also been a part of the Bloomfield Cricket and Athletic Club, which is one of the oldest clubs in Sri Lanka. He has been a part of the Basnahira North Cricket team which represents the Northern region of Western Provinces, Sri Lanka in first-class cricket. Pradeep has also played for the Ruhuna Cricket team which takes part in the Sri Lankan Inter-Provincial Tournament, representing the Southern Province.